just to mention a few. And above all, it just tastes so good. However, the truth is that one of the main advantages of getting a Nespresso machine is that you have a wide range of flavors to choose from. So, which are the best Nespresso flavors? All you need to know about coffee. One thing is for sure: we are not all the same and what can be the best Nespresso flavor for some may not be for others. So, we decided to take a look at the highly-rated Nespresso capsules flavors by users and we combined them in our best Nespresso flavors list. When you are looking for the best Nespresso flavors and you like a serious coffee flavor, the Nespresso OriginalLine: Arpeggio may be a great option for you. One of the things that we love about the Nespresso OriginalLine: Arpeggio is the fact that you’ll be able to notice the smell of the brewing as you are drinking it. It’s simply amazing. Besides, you just can’t forget about the beautiful crema that also comes along with each cup of coffee that you decide to drink. The truth is that you can use the Nespresso OriginalLine: Arpeggio to drink a beautiful espresso but you can also use it if you want to taste a cappuccino or a latte as well. 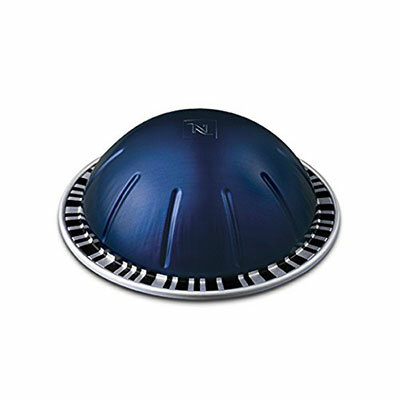 The Nespresso OriginalLine: Arpeggio is a Nespresso OriginalLine pod and has an intensity of 9. The Nespresso OriginalLine: Arpeggio includes Arabica beans from Central and South America and you can expect to notice some cocoa notes in this full-bodied coffee. The flavor is very well balanced making it amazingly bold. Specifically designed only for the VertuoLine Nespresso machines, the Nespresso VertuoLine Altissio Espresso is another great option when you are searching for the best Nespresso capsules flavors. While this is not a weakling coffee it is not as strong as some people prefer. The reality is that we can say that is enough bold but it also features a smoothness that you won’t find anywhere else. You can use the Nespresso VertuoLine Altissio Espresso not only to drink a beautiful espresso as well as you can try out to make a mocha as well. Nevertheless, according to our opinion, the Nespresso VertuoLine Altissio Espresso is perfect to use for an espresso and you don’t even need to add any sugar. With an intensity of 9, the Nespresso VertuoLine Altissio Espresso is a beautiful blend of South America Robusta and Costa Rican Arabica coffees. The roasting is short but it is definitely intense enough to provide you with a full-bodied cup of coffee. You can expect to get a robust cup of coffee with a smoky flavor, and a thick nut finish. Discover the best Nespresso capsules. 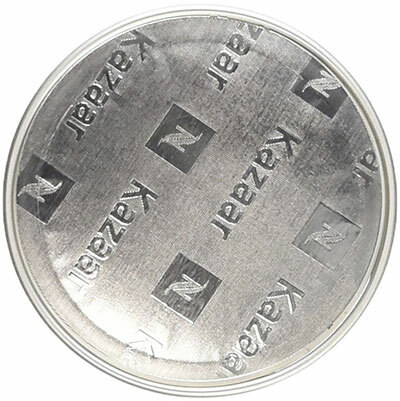 When you are searching for the best Nespresso capsules flavors, you need to consider the Nespresso OriginalLine Kazaar. The truth is that this is the perfect flavor when you absolutely love an intense flavor and taste. If you are the kind of person who loves some bitterness at the end as well as an intensity and strong flavor, the Nespresso OriginalLine Kazaar is the right choice. After all, it has an intensity of 12. You can use the Nespresso OriginalLine Kazaar for making the best espressos but also to make ristrettos or even lattes. So, it’s very flexible. The Nespresso OriginalLine Kazaar is a combination of Brazilian Robusta and Guatemalan Robusta and it’s an ultra-dark roast. In terms of the flavor, we can definitely say that the Nespresso OriginalLine Kazaar isn’t suitable for the casual coffee drinker. After all, the flavor is quite bitter and super rich. 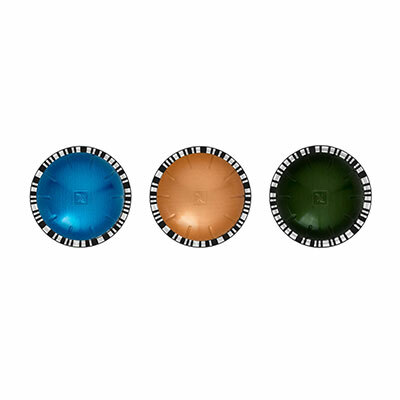 Overall, the Nespresso OriginalLine Kazaar is the most intense Nespresso capsule flavor that you can choose. After we mentioned a flavor that isn’t suitable for every coffee lover, it’s time to gather more consensus with the Nespresso OriginalLine: Ristretto. 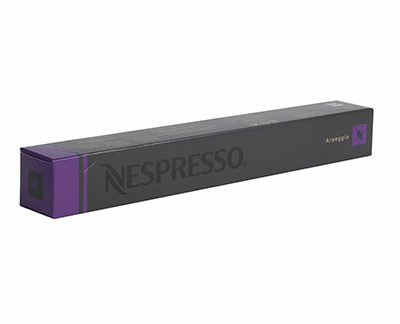 The reality is that this is one of the best Nespresso flavors according to many users even though it is considered high in terms of intensity. One of the best things about the Nespresso OriginalLine: Ristretto is that you can use it for both espressos and ristrettos. In addition, you can also try to make some cappuccinos or lattes as well. The reality is that the strong flavor and taste actually hold well even when you add milk to it. Something that is often referred to by users is the fact that the Nespresso OriginalLine: Ristretto is always balanced, foamy, and creamy. Besides being quite addictive. With an intensity of 10, the Nespresso OriginalLine: Ristretto is a mix of South American and East African Robusta zing. In terms of the aroma and taste, this Nespresso capsule flavor couldn’t be better. You will get some vanilla creaminess as well as a chocolaty taste. While it remains smooth and well balanced, the truth is that it is slightly acidic and somehow strong at the same time. One of the best things about the Nespresso OriginalLine: Rosabaya is that it is simply perfect no matter if you like the amazing espresso or if you prefer a longer coffee sometimes. The Nespresso OriginalLine: Rosabaya features a natural berry sweetness that you can even improve by adding some sugar to your coffee. And in case you want to add some milk to it, you will get an absolutely amazing crema. With an intensity of 6, the Nespresso OriginalLine: Rosabaya is one of the few Nespresso capsules flavors that have a single origin. In this case, the Arabica beans come from small farms in the highest regions of Columbia where they are handpicked and split-roasted. This ensures that you get a super aromatic coffee with some cranberry and red currants flavors. If you prefer you espressos or long coffees without any bitterness and with a balanced and smooth flavor, the Nespresso OriginalLine: Rosabaya is the right choice for you. In what comes to coffee preferences, each one of us has their own. As we said at the beginning, we want to make sure that no matter your preferences, you can still find the best Nespresso flavors for you. So, if you are into flavored coffees, you may like the Nespresso OriginalLine: Ciocattino. While there is a huge variety of flavored coffees between cinnamon, vanilla, caramel, chocolate among many others, the Nespresso OriginalLine: Ciocattino is one of the most balanced approaches of Nespresso. As soon as you taste it, you will understand why. After all, you end up with a coffee that isn’t too bitter but it isn’t too sweet either. 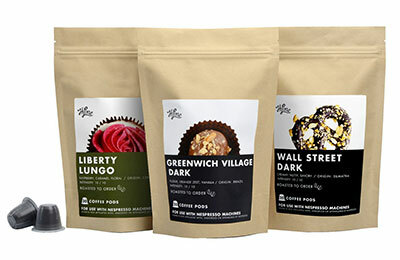 So, you can expect to get an amazing rounded and strong flavor in every single cup. And in case you like mochas, the Nespresso OriginalLine: Ciocattino is just the perfect choice. With an intensity of 6, the Nespresso OriginalLine: Ciocattino originates in Costa Rica and Columbia. As for the flavor, you will notice the chocolate but also the taste of the coffee. However, you can also expect to get some cereal and malt flavors at the end, without making it too sweet or too bitter. The reality is that we are not all the same in what concerns to our coffee tastes. While some people prefer a strong cup of coffee, others prefer a more smooth cup. 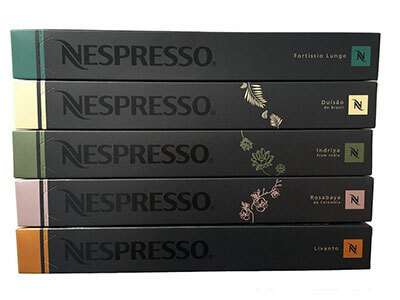 If you belong to the first group and you don’t want to spend a fortune on the Nespresso capsules flavors, one of the best things you can do is to try out the Bestpresso Nespresso Compatible Gourmet Coffee Capsules- 120 Pod Intenso Blend (High Intensity). 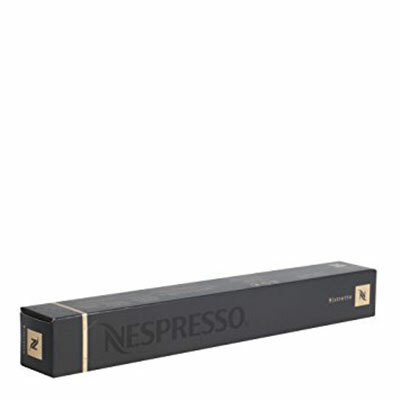 The Bestpresso Nespresso Compatible Gourmet Coffee Capsules- 120 Pod Intenso Blend (High Intensity) includes 160 capsules of a high-intensity roast. 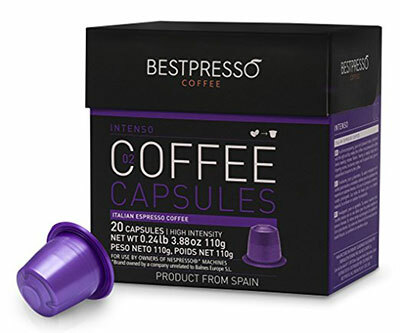 One of the best things about the Bestpresso Nespresso Compatible Gourmet Coffee Capsules- 120 Pod Intenso Blend (High Intensity) is the fact that the company has a huge care about the environment. After all, their capsules are made of 100% recyclable material and they are also food industry certified. When you are looking for an intense flavor that isn’t bitter, the Bestpresso Nespresso Compatible Gourmet Coffee Capsules- 120 Pod Intenso Blend (High Intensity) is a great option. Besides the price is more affordable than the original Nespresso capsules, they include no flavoring, sugar, or preservatives. Check out this Nespresso Capsules intensity guide. Last but not least, we just couldn’t forget the VertuoLine Nespresso machines. So, in case you have one, one of the best Nespresso capsule flavors that you can get is the Nespresso VertuoLine Diavolitto Espresso. The truth is that the Nespresso VertuoLine Diavolitto Espresso may be a bit too strong or quite bitter for casual coffee drinkers. Nevertheless, if this is the way you like your coffee or if you love the flavor and taste of a longer Americano or a lungo, the Nespresso VertuoLine Diavolitto Espresso is for you. One of the best things about the Nespresso VertuoLine Diavolitto Espresso is that you will get an amazing and beautiful foam and crema every single time. With an intensity of 11, the Nespresso VertuoLine Diavolitto Espresso is a blend of Brazilian Arabica and Central and South America Robusta beans. In each cup, you can expect a full and intense flavor and an amazing crema. The truth is that Nespresso machines are incredibly popular. With so many different models, there is one that suits everyone. One of the things that make Nespresso machines unique is the fact that they provide you with a wide range of capsules with many different coffee flavors. So, you can be sure that you will find the best Nespresso capsules for you. If there is something that is important to mention when we are talking about Nespresso capsules is that the brand had two different lines of coffee machines: The OriginalLine, which brew espressos only, and the VertuoLine, which brews not only espressos but coffee as well. The reason why it is important to know this difference is that each line of Nespresso machines uses their own capsules. Discover the secrets of a good cup of coffee. When you are looking for the best Nespresso capsules, you need to know that these can be quite expensive. 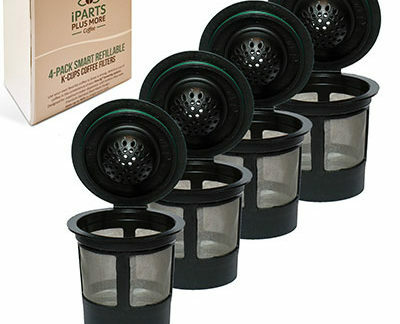 So, not surprisingly, you can find many alternatives to the original capsules that work with Nespresso machines. While money may not be an issue for you, the truth is that we all like to save some. And if the coffee will continue to taste the same way, why shouldn’t you use these alternative capsules? 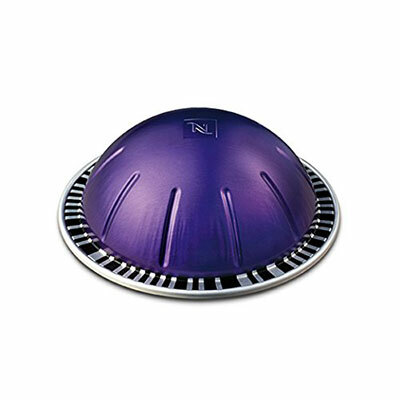 When you are looking for the best Nespresso capsules, we just could not forget about mentioning the Nespresso OriginalLine Capsules. The Nespresso OriginalLine Capsules come with 50 capsules and it is one of the best ways that you have to try out different coffee flavors to see which one you prefer. 10 Linizio Lungo capsules: This is one of the best choices for your morning coffee. After all, it features a well-rounded and smooth blend. It has an intensity of 4. 10 Rosabaya capsules: The coffee is balanced and fruity. It is roasted individually and comes from Colombia. You will notice some winey and red fruits notes. It has an intensity of 6. 10 Dulsao capsules: Dulsao comes from Brazil and it is a great and smooth blend of yellow and red Bourbon beans. This is a pure Arabica coffee with an intensity of 4. 10 Indriya capsules: You can expect a strong spicy flavor and taste that comes from the Indriya, a powerful spice from India and that mingles really well with the Robusta and Arabica coffee beans. It has an intensity of 10. 10 Fortissio Lungo capsules: Coming from South and Central American, this coffee is a blend of Arabica with some hints of Robusta. So, you can expect some bitterness and some notes of dark roasted beans. It has an intensity of 8. In case you have a Nespresso VertuoLine, one of the best Nespresso capsules that you can try out is the Nespresso Vertuoline Best Seller Assortment. Just like with the previous capsules, the Nespresso Vertuoline Best Seller Assortment comes with a wide variety of coffee flavors which is perfect to try out the best Nespresso pods and then decide which one of your favorite. The Nespresso Vertuoline Best Seller Assortment includes 30 capsules: 10 Stormier capsules, 10 Odacio cpsules, and 10 Melozio capsules. One of the things that you can express from the Nespresso Vertuoline Best Seller Assortment is that they are all dark and medium roast coffees. So, if this is what you prefer, the Nespresso Vertuoline Best Seller Assortment is a great option. Take a look at the best Vietnamese coffee. The truth is that Nespresso original capsules and pods can become a bit expensive. 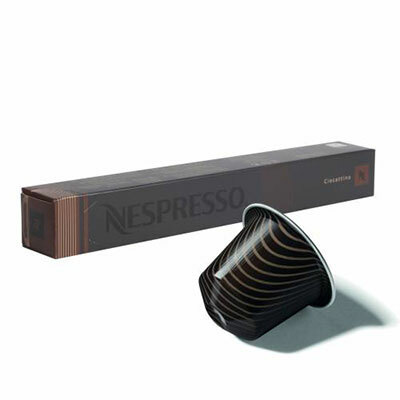 So, you have the option to look at other companies that manufacture the best Nespresso compatible capsules. One of the best examples we can provide you with is the Alchemy Superior Goods Reusable Nespresso Capsules. The Alchemy Superior Goods Reusable Nespresso Capsules are only compatible with the OriginalLine machines and you can easily make your favorite Americanas, lattes, cappuccinos, and espressos. Instead of selling you the capsules on their own, you can simply buy your favorite coffee and pack it into the reusable capsule. 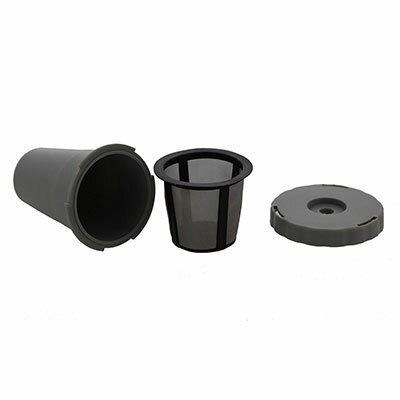 One of the best things about the Alchemy Superior Goods Reusable Nespresso Capsules is the fact that the filter is made of stainless steel micro mesh and it can be washed in your dishwasher. In addition, it is free from BPA and other toxic products. When you are looking for the best Nespresso pods, one of the best options that you have is the 60 Count HiLine Coffee Dark Roast Capsules. This brand imports their coffee from small lot farms in high altitudes in South America, Africa, and Latin America, and they only sell online. 20 Wall St Roast capsules: With Sumatra origin, these capsules have an intensity of 10. You can expect to get a savory, nutty, and rich cup of coffee. 20 Liberty Lungo Dark Roast capsules: These capsules are made with coffee that comes from Colombia and you can expect a perfect balance of floral and raspberry notes as well as a bold finish. It is incredibly aromatic. 20 Greenwich Village Roast capsules: Originated from Brazil, these capsules offer a well-rounded and zesty yet sweet flavor. They have an intensity of 10. 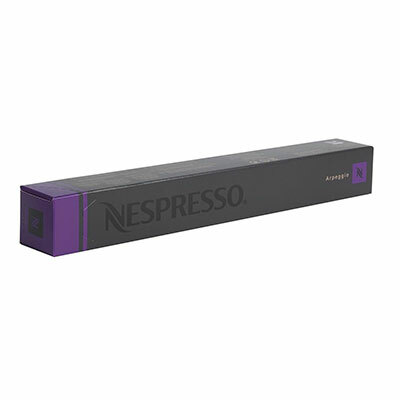 The truth is that there is a wide variety of Nespresso pods that you can find on the market. However, when you are only looking for the best Nespresso pods, we need to mention the Cafe Joe USA Espresso Capsules, CUBA, Nespresso Original Compatible Pods. The Cafe Joe USA Espresso Capsules, CUBA, Nespresso Original Compatible Pods is fairly recent in the American market but they have been a leader in Israel. While they don’t offer such a wide variety of roasts as other players on the market, the truth is that they deserve their spot on our list. 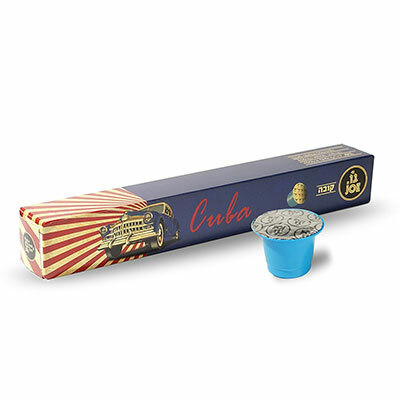 The Cafe Joe USA Espresso Capsules, CUBA, Nespresso Original Compatible Pods features an amazing Caribbean taste with a slight fragrance of Cuban tobacco and some hints of dark chocolate. One of the best things about the Cafe Joe USA Espresso Capsules, CUBA, Nespresso Original Compatible Pods is that you will always have that amazing cream that you love on your Nespresso expressos. 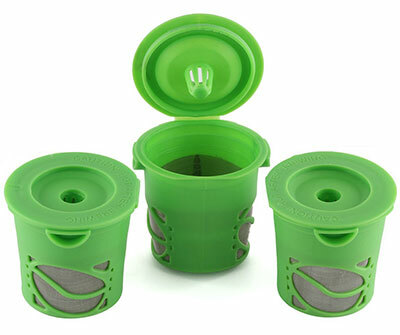 In addition, their capsules feature the innovative and airtight “EVO” technology that maintains their coffee always fresh. The Cafe Joe USA Espresso Capsules, CUBA, Nespresso Original Compatible Pods are compatible with all OriginalLine machines. Finding the best Nespresso pods isn’t an easy mission. After all, with so many different brands, it almost seems impossible to find the best ones. However, one thing is for sure. 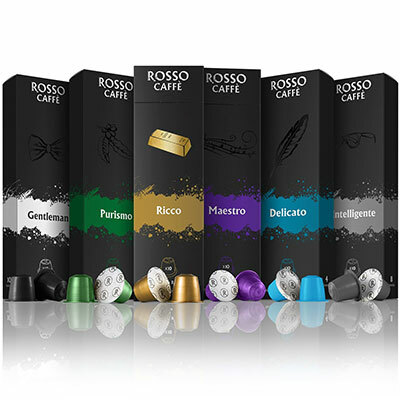 You can count on the Compatible Nespresso Capsules – OriginalLine machines – Variety Pack (60 Pods) – By Rosso Caffe to deliver the best cup of coffee every single time. 10 Purismo and 10 Delicato pods, which ate light roast blends. 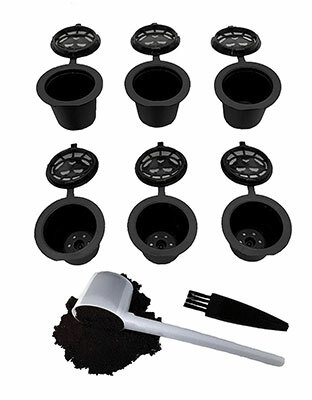 10 Ricco and 10 Intellegente pods, which ate medium roast blends. 10 Gentleman and 10 Maestro pods, which are dark roast blends. 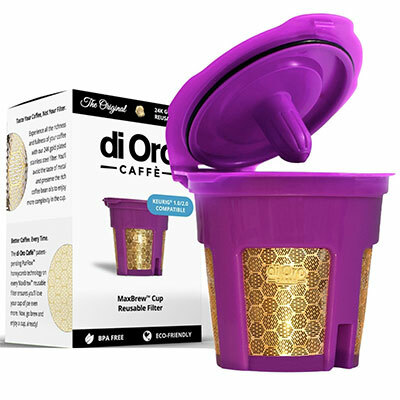 All the capsule casings from Compatible Nespresso Capsules – OriginalLine machines – Variety Pack (60 Pods) – By Rosso Caffe ate completely safe (free from halogens, BPA, and phthalates) and 100% recyclable. 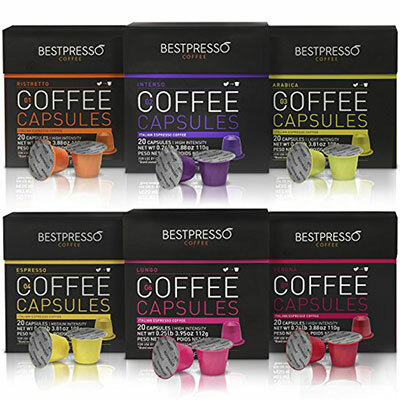 One of the best brands that you can consider when you are looking for the best Nespresso compatible capsules is Bestpresso Coffee. This Spanish company has a lot of positive ratings from their users who consider their Nespresso capsules to be one of the best on the market. 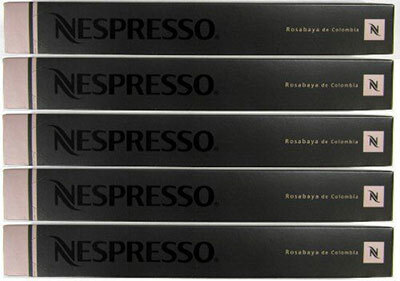 The Bestpresso Coffee for Nespresso OriginalLine Machine 120 pods has been Kosher certified by the orthodox union and it includes 6 different boxes. Each box comes with 6 bags, each containing 10 capsules. The Bestpresso Coffee for Nespresso OriginalLine Machine 120 pods is another great way that you have to try out different flavors and tastes and to see which coffee you prefer. You can also use the Bestpresso Coffee for Nespresso OriginalLine Machine 120 pods to ensure that you always have different coffee at home that satisfies all your family members and friends, besides you if you are one of those people who don’t like to drink the same coffee over and over again. 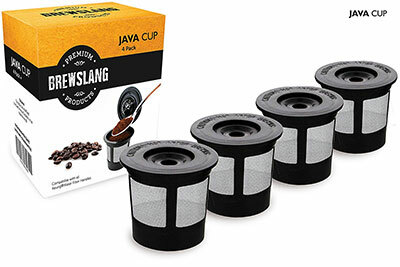 In case you just bought your first OriginalLine Nespresso machine or if you are tired of spending too much money on original Nespresso capsules, the Jones Brothers Coffee Nespresso Compatible Coffee Capsules – 50 Pod Variety Pack is a great alternative. 2 strong Ristretto blends: Noir with an intensity of 10 and Gigolo with an intensity of 12. 1 Espresso roast: Enigma with an intensity of 8. 2 Lungo: Revive with an intensity of 8 and Elevate with an intensity of 5. 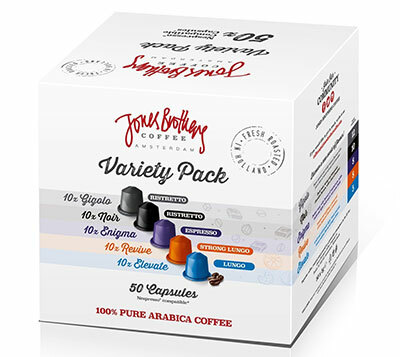 The Jones Brothers Coffee Nespresso Compatible Coffee Capsules – 50 Pod Variety Pack is imported from Amsterdam and their capsules don’t include any flavor, sugar, or preservatives. The Caffé Hardy Milan Nespresso Compatible Coffee Capsules (Complete Variety Pack) are considered by many coffee lovers as one of the best Nespresso compatible capsules in the market. Originated in Milan, Italy, the Caffé Hardy Milan Nespresso Compatible Coffee Capsules (Complete Variety Pack) are only compatible with the OriginalLine Nespresso machines. One of the things that we really love about the Caffé Hardy Milan Nespresso Compatible Coffee Capsules (Complete Variety Pack) is the freshness on each one of their capsules. After all, the coffee is only roasted and packaged before it is shipped to the United States. 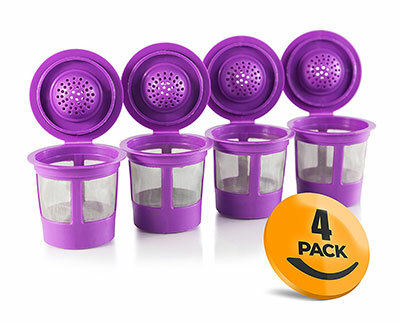 In addition, each one of their coffee capsules us individually vacuum sealed to ensure that your coffee does n0t lose any flavor and that it doesn’t oxidize. In case you already tried some of the Nespresso original capsules, you will like to know that the Caffé Hardy Milan Nespresso Compatible Coffee Capsules (Complete Variety Pack) light roasts are similar to the Livanto, Capriccio, Volluto, and Cosi, and that their darker roasts are similar in flavor to Ristretto, Roma, Arpeggio, Dharkan, and Kazaar. The truth is that not everyone likes coffee and some prefer a decaf. If this is your case, you can rest assured that you can also find the best Nespresso compatible capsules. One of them is the Carter Phillip Decaf Nespresso Compatible Capsules – 30 Count. Featuring a dark roast decaf profile, the Carter Phillip Decaf Nespresso Compatible Capsules – 30 Count features a rich flavor, a tempting aroma, and some subtle chocolaty notes. The Carter Phillip Decaf Nespresso Compatible Capsules – 30 Count includes high-grown Colombian Arabica beans that are carefully decaffeinated to ensure that you are still able to enjoy their full-bodied flavor. 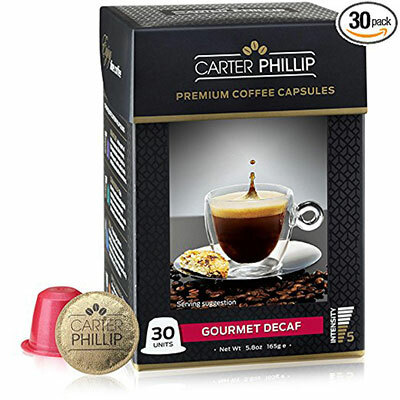 The Carter Phillip Decaf Nespresso Compatible Capsules – 30 Count capsules are hermetically and airtight sealed to retain the maximum flavor and preserve freshness. 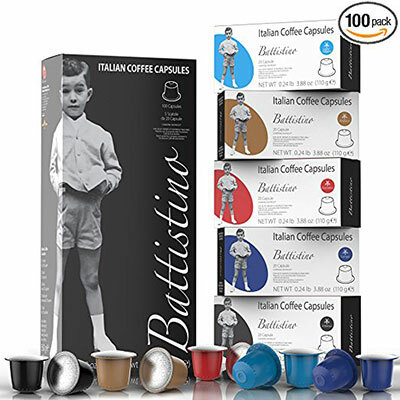 If you are an Italian coffee fan, you are going to love the Battistino Italian Premium Coffee Nespresso Compatible Pods for Nespresso OriginalLine – 100 Pod Variety Pack. Notice that these pods are only compatible with the OriginalLine Nespresso machines. One of the best things about the Battistino Italian Premium Coffee Nespresso Compatible Pods for Nespresso OriginalLine – 100 Pod Variety Pack is that you will be able to try out 5 different brews: Arabica, Intenso, Ristretto, Lungo, and Light, allowing you to try out different levels of strengths and intensities. With the Battistino Italian Premium Coffee Nespresso Compatible Pods for Nespresso OriginalLine – 100 Pod Variety Pack, you will only get the pure Italian coffee without any preservatives or additives. Discover the best way to clean your Nespresso machine. 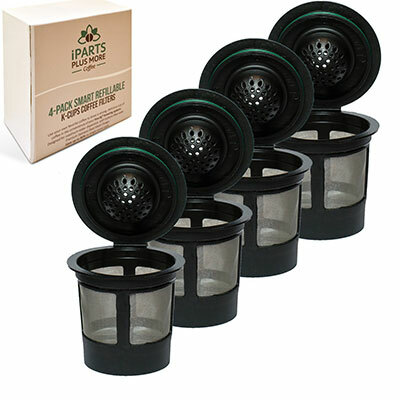 Only compatible with the OriginalLine Nespresso machines, the Cap’Mundo Paris Nespresso Compatible Coffee Capsules (Complete Variety Pack) – French Artisanal Espresso are also a great option when you are looking for the best Nespresso capsules. 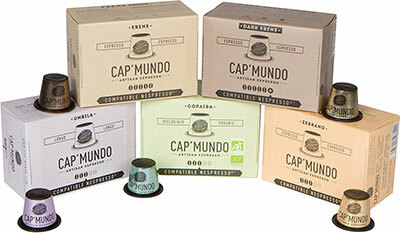 One of the secrets that make the Cap’Mundo Paris Nespresso Compatible Coffee Capsules (Complete Variety Pack) – French Artisanal Espresso one of the best brands is their roasting process. After all, besides buying only the best coffee beans, the company ensures that they work with the same farmers every single time. Then, in terms of the roasting process, they keep using a second generation Parisian roast master who roasts each blend for 15 minutes. So, you can expect to get a beautiful cup of coffee with a complex and full flavor every single time. When you are a coffee lover, you already know that there are many different types of coffee and coffee brands that you can choose from. While there are many different types of coffee that tend to be more known like the Arabica or the Robusta coffee, fewer people are aware of the Vietnamese coffee. And the reason is simple: this is a special type of coffee and not everyone likes it. All you need to know about coffee and coffee makers. In case you never heard about the best Vietnamese coffee, you need to know that it is almost like Robusta. As you probably already know, the most well-known coffee comes from Brazil and it is usually Arabica. Nevertheless, Vietnam is the second largest coffee exporter in the world. However, the main bean they export is Robusta. One of the reasons why many people don’t like Robusta that much is because it tends to be stronger and a bit more bitter. In addition, it also has an inferior percentage of sugar which doesn’t please many coffee drinkers. So, if you prefer your coffee strong and maybe a bit bitter, then you’ll love the best Vietnamese coffee. When you are looking for the best Vietnamese coffee, one of the best choices that you have is the Trung Nguyen Vietnamese coffee. The Trung Nguyen is a highly-trusted brand that sells amazing coffee from Vietnam that you’re going to love. The Trung Nguyen Vietnamese coffee has the perfect aroma, unique preparation, and flavor of the traditional Vietnamese coffee. In case you never tasted this kind of coffee, the Trung Nguyen Vietnamese coffee is a great start point since it’s not very acidic. Slightly lighter than a French roast, the Trung Nguyen Vietnamese coffee is grown and roasted in Vietnam, and is grounded to the right coarseness to ensure that you are able to delight yourself with a true coffee from Vietnam. The Trung Nguyen Vietnamese coffee is a blend of Arabica, Robusta, Excelsa, and Catimor. 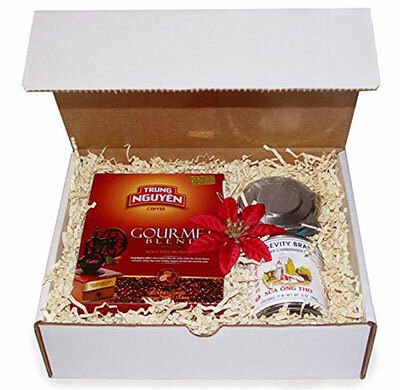 The Heirloom Coffee LLC Vietnamese Coffee Kit is a great option when you want to try out the best Vietnamese coffee. One of the things that we like about the Heirloom Coffee LLC Vietnamese Coffee Kit is that you can either brew iced or hot coffee and try out the two. 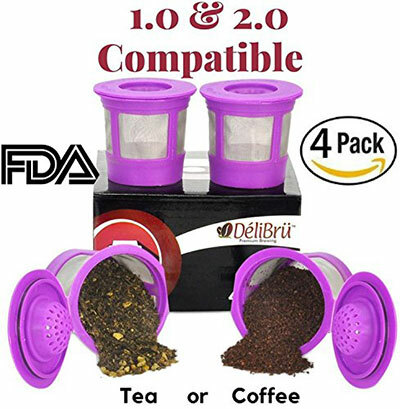 This kit comes with a traditional Phin brewer that is made of stainless steel and is the right one when you want to drink the best Vietnamese coffee. You will also get the Trung Nguyen Gourmet Blend coffee, and the Longevity sweetened condensed milk so that you can experience the traditional Vietnamese coffee as if you were there. Take a look at the best hand coffee grinders. 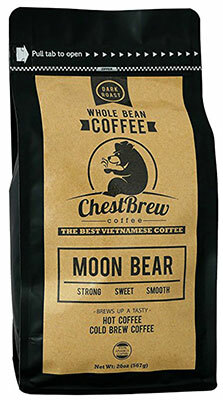 If you are a lover of strong coffee, the Chestbrew Whole Bean Coffee. Strong Dark Roast Vietnamese Coffee is the right choice for you. The Chestbrew Whole Bean Coffee. Strong Dark Roast Vietnamese Coffee only includes the best Arabica beans from Vietnam and you will get an exotic full of flavor Vietnamese coffee cup. With the Chestbrew Whole Bean Coffee. Strong Dark Roast Vietnamese Coffee, you can either brew hot or iced coffee. The truth is that when you are a coffee lover, you love to brew the coffee beans and feel that lovely smell of the brewing process. However, we also understand that sometimes, you just want to have a cup of coffee of Vietnamese coffee that tastes good but that doesn’t take too long to prepare. 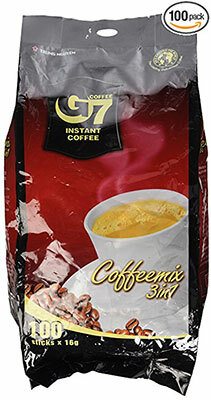 With this in mind, you can try out the Trung Nguyen G7 3-in-1 Instant Premium Vietnamese Coffee. The Trung Nguyen G7 3-in-1 Instant Premium Vietnamese Coffee has a superior taste because it is roasted using a patented dry process that helps it maintain its natural characteristics. The Trung Nguyen G7 3-in-1 Instant Premium Vietnamese Coffee is a great option when you need to travel or simply to have at home when you are in a hurry. All you need to do to prepare it is to add some hot water and stir. 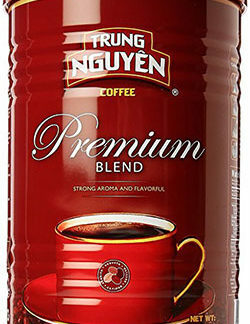 When you want to try out the best Vietnamese coffee but you are a bit afraid of the acidity or bitterness, one of the best options that you have is to try out the Trung Nguyen Gourmet Blend. 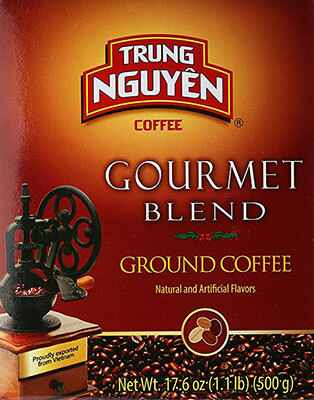 The Trung Nguyen Gourmet Blend is the perfect blend of Arabica, Robusta, Excelsa, and Catimor beans. With a low acidity and medium caffeine, the Trung Nguyen Gourmet Blend will provide you with an amazing cup of coffee rich in flavor and with some chocolate tones. Grown across the Buon Me Thuot Highlands, the Trung Nguyen Gourmet Blend is incredibly fragrant. 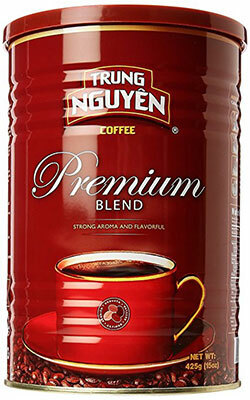 The Trung Nguyen Buon Me Thuot Special Ground Coffee is the most popular coffee to brew at home in Vietnam. So, you can be sure that you will get the identical flavor and taste of the best Vietnamese coffee. The Trung Nguyen Buon Me Thuot Special Ground Coffee is a mixture of 4 different beans – Arabica, Robusta, Excelsa, and Catimor. One of the things that we really like about the Trung Nguyen Buon Me Thuot Special Ground Coffee is its naturally sweet, rich, and intense taste. You are going to love this one. Discover the right way to brew Vietnamese iced coffee. The last option that we have for you is a true and authentic Vietnamese coffee – the VN Roaster Authentic Vietnamese Coffee. 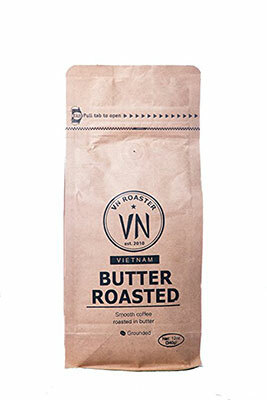 Sourced from the Dak Lak region in Vietnam, which is known as the capital of the country’s coffee, the VN Roaster Authentic Vietnamese Coffee coffee beans ate perfectly roasted in butter. So, you can expect a smooth and very rich finish. To complement the flavor, the VN Roaster Authentic Vietnamese Coffee only uses 100% Arabica beans that add a somewhat bold flavor to an already amazing cup of coffee. When you are looking for the best coffee brewer, you will definitely find the Keurig K425 and the Keurig K475. After all, they both have a lot of positive feedback from users and they are made by one of the best manufacturers – Keurig. Nevertheless, there are still many people who don’t see the differences between both models and they want to make sure that they make the best decision. If you’re in this situation, make sure that you keep reading this Keurig K425 vs K475 comparison. As you can easily see in the images posted above, both models are very similar and you can hardly notice any difference. After all, they both have the same dimensions and they are both available in 3 colors: platinum, red, and black. Nevertheless, you will easily notice that while the K425 only features LCD screen signals, the K475 includes strength and temperature controls. We will come back to these later. The truth needs to be said and in terms of the flavor, taste, and aroma, both Keurig models are able to deliver a great cup of coffee. In addition, in case you prefer to brew a tea, hot cocoa, chocolate or a cold beverage, they will both be able to handle them. However, there is a very important difference between the Keurig K425 and the Keurig K475 – the ability to set your preferences. While with the Keurig K475 you can not only control the temperature as you can control the strength of your drink, with the Keurig K425 this is not possible. Check out the ultimate Keurig K475 vs K575 comparison. The truth is that both the Keurig K425 and the Keurig K475 are easy to clean and maintain. Nevertheless, they use a different system. So, the one that is better also depends on your personal preferences. 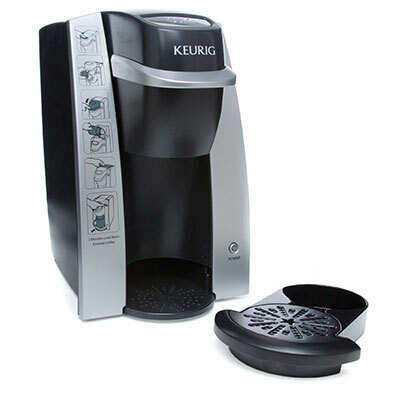 While the Keurig K425 comes with a removable drip tray, the Keurig K475 comes with a dispense hot water. As you can see, the two Keurig coffee makers have a lot of similarities but a lot of differences as well. The truth is that this is perfectly normal since the Keurig K475 is the successor of the Keurig K425. So, the company wanted to make sure that it made it better and solved a couple of problems that were associated with the K425. While brewing coffee was never a problem with the Keurig K425, we cannot say the same thing about the bugs and glitches some users complain about. Should you buy a Keurig or a different brand? Overall, when you are a coffee lover, you will love both. Nevertheless, why would you want to buy a discontinued model like the Keurig K425 when you can buy its successor – the Keurig K475? If this isn’t a sufficient reason for you, just consider the fact that you have complete control over your coffee. After all, with the Keurig K475, you can set the exact temperature and strength that you love. And this isn’t simply possible with the Keurig K425. So, in our opinion, you should definitely consider buying the Keurig K475 coffee maker. When you are looking for the best coffee maker, you know that you have a lot of options. 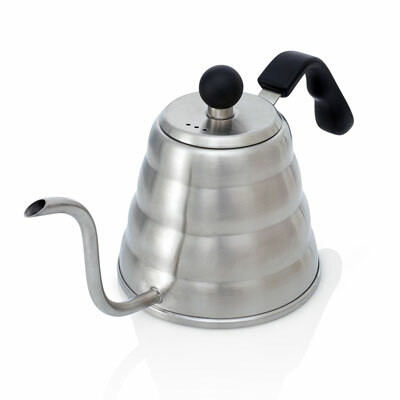 There aren’t only a lot of coffee maker manufacturers as they are many different coffee makers. So, you may end up completely lost with such a wide variety. While there are many good coffee maker brands, one of our favorite ones is Keurig. Not only they have a wide range of coffee makers for all prices and features as their products tend to last for a very long time. Since Keurig has so many amazing coffee makers, many coffee lovers tend to have a lot of doubts between very similar coffee makers. This is the case of the Keurig K50 and the Keurig K55. Get a complete coffee guide. So, if this is where you are standing right now, we want to give you a hand and show you a detailed comparison. So, take a look at the Keurig K50 vs K55 comparison. 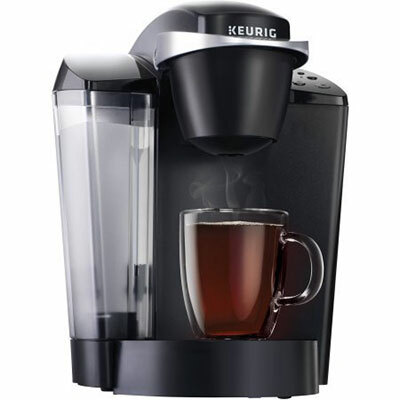 The Keurig K50 is a classic brewer that is very popular. After all, the Keurig K50 allows you to easily make an amazing coffee, tea, hot cocoa, and even iced beverages in just a few minutes. With the Keurig K50, you can choose between different brew sizes which is great. In addition, you can expect to find a removable drip tray to ensure that your kitchen is always cleaned as well as the water reservoir is big enough. Featuring a compact and lightweight design, the Keurig K50 matches all kitchens, from the smallest to the largest ones. 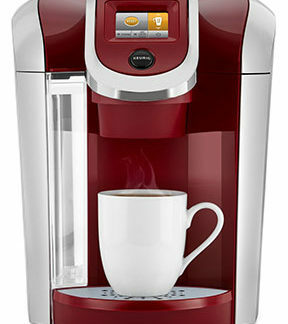 In what concerns with the Keurig K55, we need to say that this is the successor of the Keurig K50. So, obviously, it is an upgrade of the model we just looked at above. 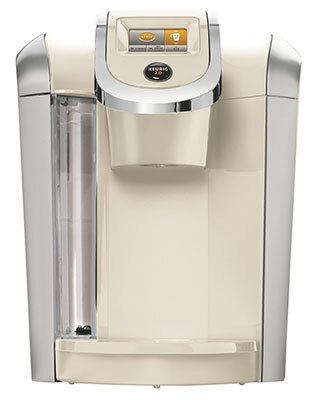 With the Keurig K55, you have a bigger water reservoir as well as it allows you to brew more than one cup at once. In case you are worried about the design of the Keurig K55 and you don’t know if it will fit your kitchen, you need to know that the Keurig K55 is available in multiple colors. Now that we gave you a quick overview of each one of the Keurig coffee makers, let’s check their details in particular. Take a look at the best drip coffee maker machines. While both coffee makers have a good design, the truth is that there are many differences between the two. 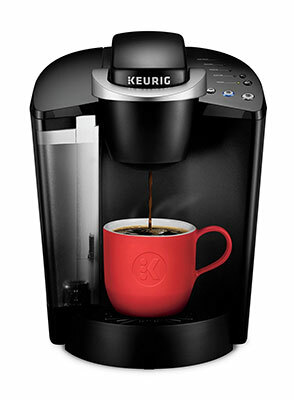 In what concerns to the Keurig K50, this model is incredibly light and compact. This ensures that you can buy it even if you have a small kitchen. However, it is only available in black. On the other hand, the Keurig K55 is slightly heavier and slightly bigger than the K50. However, you can choose between different colors to make sure that it fits with your kitchen decor. Aside from these differences, both Keurig’s are very similar in terms of the design. While the design is important since you don’t want to have an ugly coffee maker laying around your kitchen, you also understand that there are features who matter more when it is time to decide which is the best coffee maker for you. One of this features is the performance of each one of these Keurig coffee makers. Both models allow you to brew more than one coffee at once and they have a good water reservoir. In addition, both makers also come with a removable drip tray to ensure that you can easily clean it inside and to avoid all that mess around your kitchen. However, when comparing the time to brew a coffee with both coffee makers, you will notice that the K55 is quicker than the K50. Whenever you need to buy any kind of product, the price is always important. After all, depending on your budget, you can get a better deal. When you compare the price of the Keurig K50 with the price of the Keurig K55, there is a big difference. The K55 seems to cost significantly more than the K50 even though the results they deliver, in terms of the coffee flavor, taste, and aroma are pretty much the same. Nevertheless, when you know that the Keurig K55 is an upgraded version of the K50, and taking into consideration the time that it takes to brew a coffee, the bigger water reservoir, and the fact that is more reliable, the price difference will seem very small. As you can see, we examined all the details about each one of the coffee makers to ensure that you know exactly what you get with each one of them. So, which one if the best one for you? Should you buy the Keurig K50 or the Keurig K55? 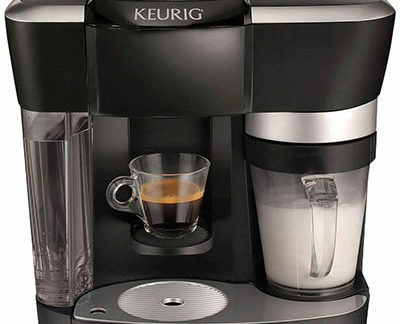 Overall, the Keurig K50 and the Keurig K55 share many similarities. They have a similar design, deliver a similar coffee, and they are both very popular among coffee lovers. One of the things that we need to mention is that the Keurig K50 is not as reliable as the K55. The truth is that although they share many features and components, the K55 was launched to overcome this lack of reliability of the K50. There are two main complaints about the Keurig K50: the coffee sometimes taste s like plastic, and it breaks easily. Discover the pros and cons of owning a Keurig. On the other hand, the Keurig K55 is functional and reliable. 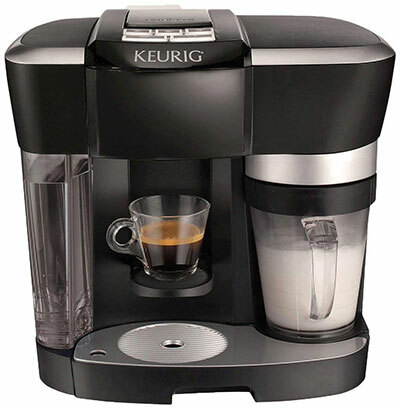 Overall, in our opinion, we believe that you should consider buying the Keurig K55 instead of the Keurig K50. The truth is that even though both coffee makers share many details, the K50 fails in terms of reliability although it is compact and more light than the K55. Even though it is more affordable, you may end up paying a lot more to replace it in a near future. Plus, the last thing you want is to never know when you will brew a coffee that tastes like plastic. 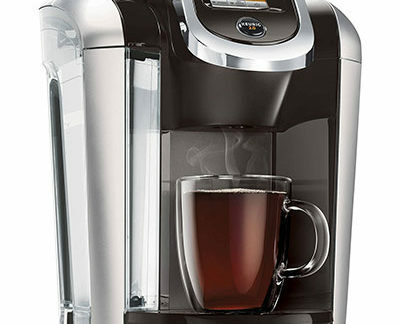 So, our opinion is that you should stick with the Keurig K55. 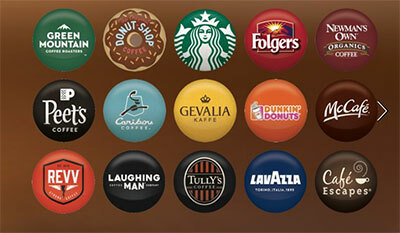 More and more coffee aficionados are looking at Keurig as one of the best coffee makers. However, when it comes the time to choose the coffee maker they want to buy, they have a lot of doubts between the Keurig k475 and the Keurig k575. So, with this in mind, we decided to make a direct comparison: the Keurig k475 vs k575. The reality is that even though Keurig has a lot of different coffee makers, the Keurig k475 and the Keurig K575 are two of the most popular ones. So, within this article, we will start by reviewing the Keurig k475 first and then the Keurig K575. In the end, we will be able to tell you which one is the best. Take a look at the best coffee makers in 2018. The first thing that is important to refer when we are making the Keurig k475 vs k575 comparison are the similarities between the two models. The reality is that both the Keurig K475 and the Keurig K575 come from the same production line. Even though their design is slightly different, the truth is that you need to pay a lot of attention to see their differences. In addition, they also share the same overall weight as well as dimensions. In terms of the electric motor that is inside each one of them, it is also the same. So, what are the differences? One of the first differences between the Keurig K475 and the Keurig K575 that you will notice is the size of the water reservoir. The truth is that it is smaller in the K475 even though you can still get a coffee in a different size. A major difference between the two models is concerned with the hot water ability. The reality is that the Keurig K475, just like all the models from K400 series don’t include this feature. So, what does this mean? Simply put, it makes the Keurig K475 less flexible and versatile than the Keurig K575. 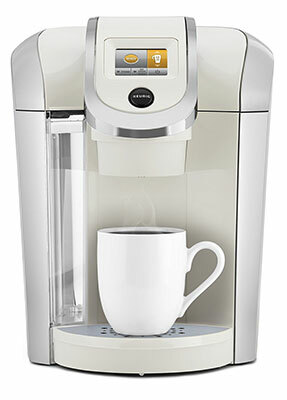 After all, with the lack of the hot water, the Keurig K475 will only be able to deliver you coffee and nothing else. While this isn’t a major lack, when you are a coffee lover, you may miss it. So, we believe that it is worth to be mentioned. Even though there aren’t any major differences regarding the design as we already mentioned, when you are comparing the Keurig k475 vs K575, you will miss the illuminated touchscreen on the K475. While this isn’t a major miss for some users, it may be for others. In addition, the touchscreen is also a bit smaller on the K475 than on the Keurig K575. So, what about the Keurig K575? One of the things that you will immediately notice when you start making a comparison between the Keurig k475 vs k575 is the price. The truth is that the Keurig K575 is more expensive than the Keurig K475. However, as we always say, you shouldn’t let the price be the only factor to consider when you are looking for the best coffee maker. While it is important, the price isn’t always the reflection of a coffee maker’s quality. So, you need to ensure that you check all the other differences before you make your final decision. While we said that there aren’t any major design differences, the truth is that if you pay attention to both models, and especially if you place them side by side, you will see some differences on the finish details. The Keurig K575 includes some premium finish that the K475 doesn’t. Nevertheless, while the K575 comes in one single color, in case you opt for the Keurig K475, you will be able to choose between different color schemes. The difference in the water reservoir in both coffee makers is just 10 ounces. Nevertheless, in what concerns a coffee maker, the bigger the water reservoir the better. So, this is clearly an advantage for the Keurig K575. As you probably remember, we mentioned the lack of hot water in the Keurig K475 and, at the time, we also said that it was included in the Keurig K575. However, this is more than just a simple add-on. The truth is that in order to enjoy this feature with the Keurig K575, you just need to press a single button. As we also mentioned earlier, the touchscreen of both coffee makers isn’t the same. The touchscreen on the Keurig K575 is bigger than on the Keurig K475 and it is better. After all, it features night mode. This means that it includes illumination that is great when you want that cup of coffee before going to bed and you don’t want to turn on the lights. As we started by saying at the beginning of this article, Keurig is one of the best coffee makers brands at the moment. 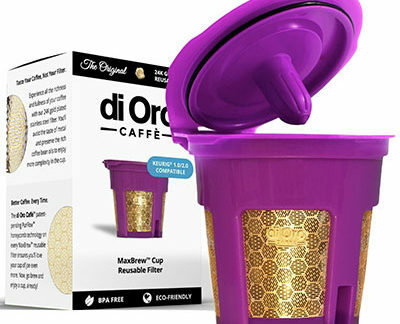 They have been developing new coffee makers and delivering high-quality products that allow coffee lovers to enjoy their perfect coffee cup every single time. Nevertheless, with so many models, it was crucial to make the Keurig k475 vs k575 comparison. After all, these are two very popular models and many people wonder about their differences to ensure they buy the best coffee maker for them. After stating the similarities and the differences between the two Keurig coffee makers, it’s time to decide which one is the best. 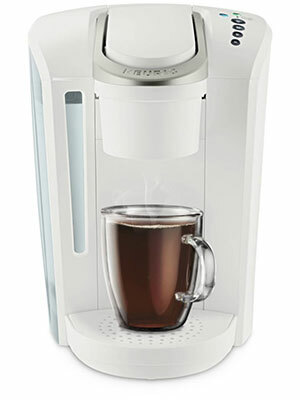 Overall, the Keurig K475 is a more affordable coffee maker that comes with a smaller water reservoir. In addition, it also comes with fewer features. On the other hand, the Keurig K575 is more expensive, has a slightly bigger water reservoir, and has more features including the addition of the night light mode as well as the hot water. In our opinion, when you are making the Keurig k475 vs k575 comparison, the best coffee maker for you depends on your own preferences. Ultimately, if you only drink coffee and if you are the only one drinking it at home (or you have a small family), you’ll be just fine with the Keurig K575. However, if you want to enjoy your cup of coffee with your family members and friends, and if you also like to try out different beverages that may need the hot water feature, you should go for the Keurig K575. Discover what you need to consider before buying a coffee maker. However, no matter which model you choose – the Keurig K475 or the Keurig K575, you can rest assured that you will get an amazing cup of coffee filled with an amazing taste, aroma, and flavor, every single time. Besides, you can be sure that they will both last for a very long time in perfect conditions. The truth is that one of the most popular coffee maker brands nowadays is Keurig. The truth is that the manufacturer is able not only to deliver a great cup of coffee every single time as they are worth every single penny, from the most affordable ones to the high-end ones. However, one of the things that we believe they should improve is that not all their K cups are able to fit all their coffee makers. Since they come in multiple sizes and Keurig has so many different models, it is quite hard to have them all work with all coffee makers. Discover the best coffee brands. So, which Keurig uses all k cups? The reality is that when Keurig released their Keurig 2.0 coffee makers, they surprised a lot of people. The coffee was even better than before and the new features included, including the new brewing system left coffee fans amazed. However, the new release didn’t leave everyone happy. After all, Keurig didn’t tell their fans that the Keurig 2.0 only brew certain K cups. The truth is that even though the brewing system of the new Keurig 2.0 was really something, most coffee lovers don’t like to be told that they just can use this or that k cup. They like to be able to choose exactly the K cups they love. They can even be the same allowed but they like to hold the ability to choose on their own. 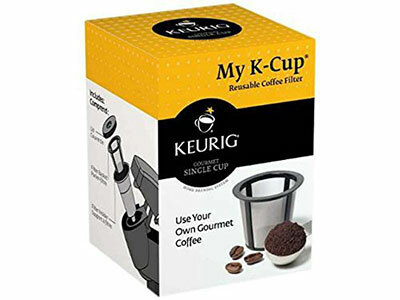 While most Keurig 2.0 models still won’t work with all K cups, there is one that accepts them all – the Keurig K575 Single Serve K-Cup Pod Coffee Maker. 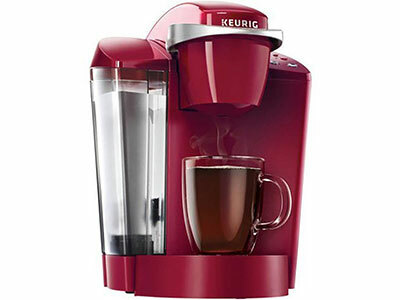 The truth is that the Keurig K575 Single Serve K-Cup Pod Coffee Maker is one of their best coffee makers. After all, it allows you to set all the options that you need to ensure that you get that cup of coffee exactly the way you love. 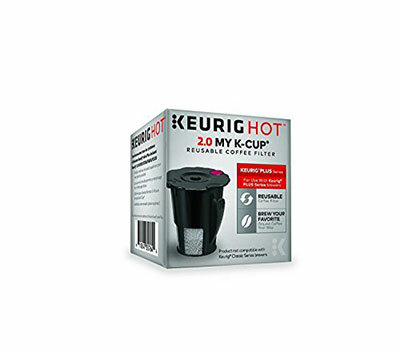 Take a look at the best reusable Keurig K cup for stronger coffee in 2018. With the Keurig K575 Single Serve K-Cup Pod Coffee Maker, you can easily use the extra-large touchscreen to select your preferences. You can decide about the temperature as well as about the brewing that you can set as low, low/medium, medium/high, and high. 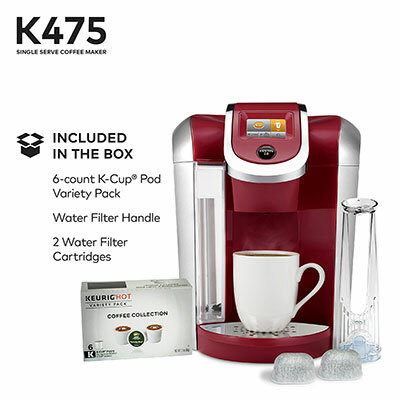 Featuring a large water reservoir that you can easily remove to fill or to clean, the Keurig K575 Single Serve K-Cup Pod Coffee Maker allows you to use all K cups that you prefer. 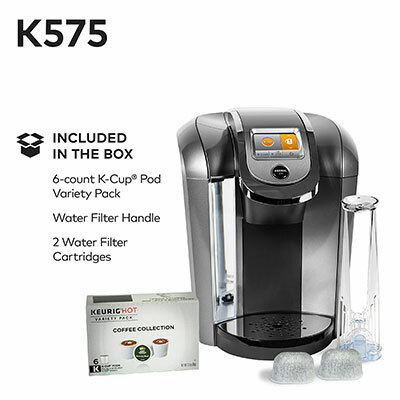 In case you decide to buy the Keurig K575 Single Serve K-Cup Pod Coffee Maker, you can expect to get the coffee maker itself as well as 5 K-Cup pods, a water filter handle, and even 2 extra filters that will help you get the best out of this Keurig. Overall, all Keurig models continue to be very popular even though most of them can be limited in what concerns the k cups that you can use. Nevertheless, the manufacturer is able to deliver exactly what coffee lovers want: an amazing cup of coffee every single time. When you are a coffee lover, there is nothing better than simply pressing a button and enjoying yourself with an amazing cup of coffee. This is especially true in the morning when you wake up. After all, you just need that cup. In order to get this, you absolutely need the best Keurig coffee maker. It’s not by chance that Keurig has been gathering a lot of fans in the last few years. The reality is that Keurig is one of the most popular coffee makers that you can not only have at home as you can also have at the office or even at your dorm if you’re still in college. We just keep getting a lot of questions about what is the best Keurig machine. After all, the reality is that Keruig has a lot of different models that vary in features, size, and style. However, one thing is for sure: there is a Keurig for every kitchen, for every office, for every coffee lover, no matter the kind of coffee that you prefer. Check out the best website for coffee lovers. Some of the best Keurig coffee makers also allow you to make hot chocolate or tea, which is perfect if your family members prefer a different drink in the morning. When you are looking for the best Keurig coffee maker that is able to provide you with flexibility and versatility, you just need to check out The Keurig Rivo Cappuccino and Latte System. 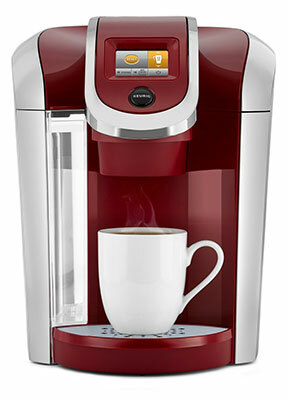 This is one of the high-end models of Keurig which also means that it is one of their most expensive coffee makers. Nevertheless, and according to our opinion, it is completely worth the price. The Keurig Rivo Cappuccino and Latte System is capable of delivering one of the best cappuccinos, lattes, and simple coffees that you have ever drunk. Featuring a cube design, The Keurig Rivo Cappuccino and Latte System is perfect for families whose members like coffee, cappuccinos and lattes. In fact, this Keurig machine allows you to froth milk in one side and brew an amazing espresso on the other side, which is incredible for mornings. On the espressos side, you can choose between two different shot sizes and you can only use Lavazzo espresso pods. Nevertheless, they have a huge variety that includes decaf, Delicato, Intenso, and Classico. On the milk frother side, you easily choose between cold froth, latte, and cappuccino. When you are trying to find out about what is the best Keurig machine, you just can’t ignore the Keurig K575 Single Serve K-Cup Pod Coffee Maker. The Keurig K575 Single Serve K-Cup Pod Coffee Maker is considered by many coffee lovers as one of the best Keurig coffee makers on the market. And the truth is that we agree with them. One of the main advantages of the Keurig K575 Single Serve K-Cup Pod Coffee Maker is that you will be able to drink your cup of coffee just the way you like. And even if your family prefers a different kind of coffee, you can be sure that the Keurig K575 Single Serve K-Cup Pod Coffee Maker will be able to deliver it as well. One of the things that we really like about the Keurig K575 Single Serve K-Cup Pod Coffee Maker is the fact that you can choose between 9 different brew sizes. Besides, it also features a large water reservoir that is capable of handling with 80 ounces of water. 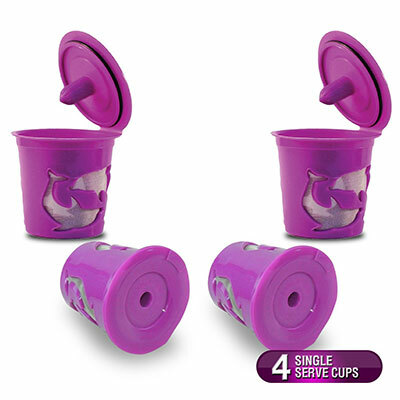 In addition, since it is removable, it is very easy to fill it whenever you need. With the Keurig K575 Single Serve K-Cup Pod Coffee Maker, you will have a complete control over your coffee taste, flavor, and aroma. After all, you can easily choose the strength of your brew as well as the desired temperature (it includes 5 different temperature settings). To control all this, you just need to use the extra large and digital color touchscreen that is very intuitive. 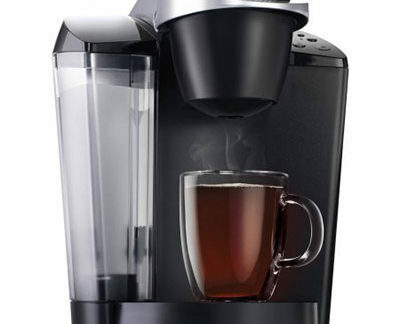 The Keurig K575 Single Serve K-Cup Pod Coffee Maker is perfect for people who are always in a rush. After all, you can start brewing your coffee manually or you can program it to have your coffee ready as soon as you wake up in the morning. Take a look at the best 4 cup coffee makers. Featuring a slim and sleek design, the Keurig 119277 K250 Coffee Maker, Turquoise is another great option when you are looking for the best Keurig coffee maker. With a 40 ounces water reservoir that is removable, the Keurig 119277 K250 Coffee Maker, Turquoise is capable of delivering a great cup of coffee every single time. The Keurig 119277 K250 Coffee Maker, Turquoise allows you to easily choose the brew size that you prefer as well as you can use multiple K-Cup pods. It even allows you to brew a Carafe if you like to take your coffee ready with you to the office. 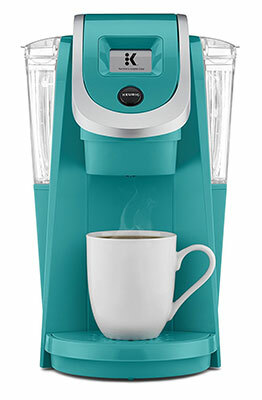 The Keurig 119277 K250 Coffee Maker, Turquoise is available in a wide variety of colors to ensure that it can fit well in your kitchen or office. I addition, and in order to ensure that you get an amazing cup of coffee every time, the Keurig 119277 K250 Coffee Maker, Turquoise comes with an intuitive touchscreen where you can select all your favorite options. When you are looking for a coffee maker that is able to deliver a good cup of amazing and that is silent, one of the best options that you have is the Keurig K-Select Coffee Machine and 32ct Peet’s Coffee Major Dickason’s Blend K-Cups. Featuring a beautiful and stylish design that will fit most kitchens, the Keurig K-Select Coffee Machine and 32ct Peet’s Coffee Major Dickason’s Blend K-Cups is a great choice for people who are usually in a rush. The Keurig K-Select Coffee Machine and 32ct Peet’s Coffee Major Dickason’s Blend K-Cups allows you to brew multiple cup sizes – 6, 8, 10, and 12 oz., and you will always get the same amazing taste no matter the size that you choose. 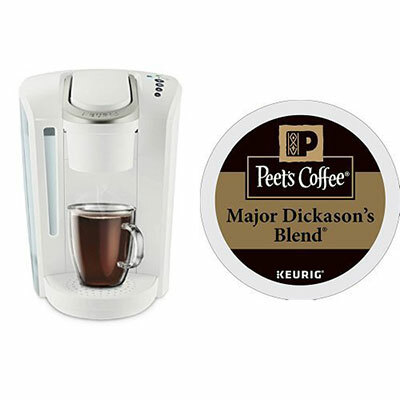 In case this is the first Keurig coffee maker that you are buying, the Keurig K-Select Coffee Machine and 32ct Peet’s Coffee Major Dickason’s Blend K-Cups is a great choice. After all, it includes a bonus 6-count K-Cup pod variety pack so that you can try out different coffees at once. The truth is that even though most of us like a good cup of coffee in the morning, it seems that the time flies and we just don’t have the time to enjoy it properly. However, with the Keurig K-Select K Coffee Maker Brewer, this nightmare can end. After all, the Keurig K-Select K Coffee Maker Brewer only takes one minute to brew an amazing cup of coffee that is simply delicious. 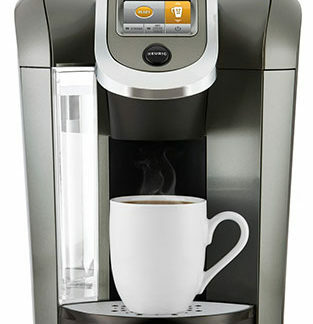 Featuring a beautiful and modern design that fits most kitchens, the Keurig K-Select K Coffee Maker Brewer is amazing. You can choose between multiple cup sizes to brew which makes it perfect even if you have a large family. In addition, the water reservoir, that is also removable, is perfectly capable of handling all those coffee cups in the morning. 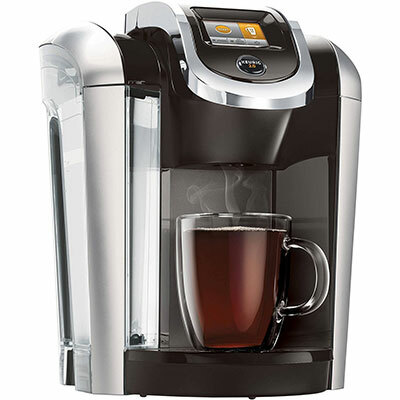 One of the best things about the Keurig K-Select K Coffee Maker Brewer is that you can easily use it to drink amazing coffee, iced beverage, hot cocoa, or even tea. Using the new Strong Brew feature, you can rest assured that you will love each cup of coffee that the Keurig K-Select K Coffee Maker Brewer delivers. Considered by many as the best Keurig coffee maker, the Keurig K475 Single Serve K-Cup Pod Coffee Maker is extremely popular. And one of the reasons for such a success is the combination of multiple features that ultimately allow this coffee maker to deliver the best cup of coffees you have ever tasted. 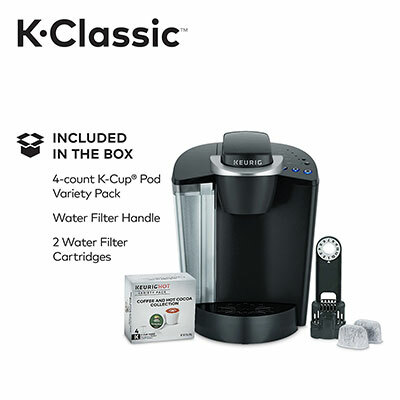 Featuring a large water reservoir that is removable and able to brew multiple K-Cup pod brew sizes including Carafe, the Keurig K475 Single Serve K-Cup Pod Coffee Maker is simply amazing. With the Keurig K475 Single Serve K-Cup Pod Coffee Maker, you can choose the strength control setting that you prefer as well as you can adjust the temperature according to your personal preferences. The Keurig K475 Single Serve K-Cup Pod Coffee Maker features a large touchscreen that also includes a digital watch, which is very intuitive and simple to use. You can even program your brewer to start making your coffee at a specific time. Pros and cons of using a Keurig coffee maker. Last but not least, we just couldn’t forget about all our college students who love to have their own coffee maker in their room. And the Keurig K-Cup In Room Brewing System is perfect for them. 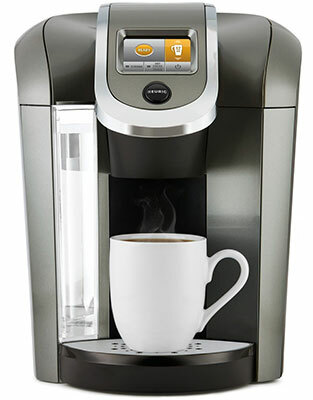 Featuring a compact design, the Keurig K-Cup In Room Brewing System is able to brew one 8 ounce cup in just 3 minutes. In addition, it also includes a mug sensor which is absolutely amazing. After all, the last thing you want is to have your room spilled with coffee or having your glass pots broken or cracked.